For Allison, improvising was love at first sight. Her young self thought: "You mean, this is a thing that people do? I can just go and play pretend with other fun people?!" It was a big deal and decades later, she's still at it. Allison Yolo hails from the Pacific Northwest, that’s right the real Washington, and fell in love with improv as a 5th grader. She reunited with this love at Western Washington University and then landed herself in Chicago. 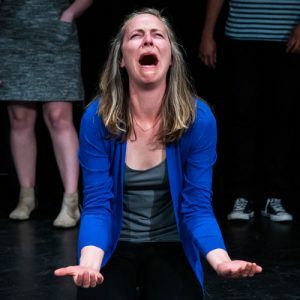 Whilst surviving six winters there, she studied at Second City and Annoyance and graduated from iO where she performed with several iO Harold Teams (ButchMax, Deep Schwa). Much fun was had on her independent, all-female team Eleanor, coached by the fun and crazy Craig Uhlir. She also had luck in being part of Fart City, an independent team, in which her now current husband played and was coached by the very wonderful TJ Jagodowski. Allison went back to straight theatre in 2013, as an original cast member of The TomKat Project (Chicago, NYFringe, LA) and as an ensemble member of the School at Steppenwolf. Most recently, she was in Seattle where she performed with Jet City Improv. When Allison is not performing, she is a full time parent, playing with her toddler. Thus far, it beats any day job she has ever had and she’s thankful that she gets to do it. Allison loves the outdoors and trees. She’s into picking up litter in parks and wants you all to know “c’mon people!” Allison learned a lot of sign language when her baby was a baby so that he could say things to her before speaking and he did and that was cool. She loves to garden and hopes to have a badass garden some day. Allison was on the price is right and won a trip to Japan.